Hard top carrier designed for all CJ and Wrangler hard tops in an upright position. Finished with a durable black powder coat and padded for added security. Comes with four caster with the two front ones lockable. About Thule Established in Sweden in 1942, Thule is a premium brand used globally for a wide assortment of products with a focus on making it easier to bring equipment with you when using a car. The company continually designs innovative roof racks, bike and water sport carriers, roof boxes, and more. Beyond that, Thule also develops accessories for recreational vehicles, trailers for active life – like horses, boats, and more -- snow chains, and luggage. UV resistant, high-density polyethylene construction. Passenger side openings for easy access. Offers 18 cu.ft. of storage space. Features 2 locking hatches to keep your items safe in the box. Dimensions: 54L x 39W x 19.5H in.. Please check the fit for your vehicle in the fit guide located in the Product Details area. Highland's U-Venture Rooftop Basket is a high quality, durable steel constructed Cargo basket that has a weather resistant finish. The sleek aerodynamic design mounts to most factory and aftermarket crossbars and includes rubber gaskets to eliminate internal rusting. 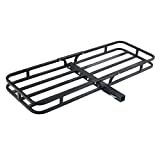 The rack is 44 inches x 35 inches x 4.25 inches and fits full size and compact sport utility vehicles and cars with roof racks with a load capacity of 125 pounds. The 1 inch bar will easily hold Highland's 9500100 cargo net (sold separately) bungee hooks for a snug fit and will also accommodate Highland cartop carriers (sold separately). We're the only manufacturer of soft car top carriers in the USA. Committed to quality and safety, our carriers are not only waterproof but also free of toxic chemicals. The Cross Country Carrier, 100% waterproof, offers the best weather protection. Made with 18-oz heavy-duty polyester canvas, coated on both sides with abrasion-resistant waterproof vinyl (unique in the market). Withstands extreme temperatures, wind, sun, rain, snow, or sand. 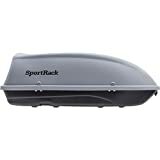 The most waterproof, heavy-duty, easy to install car top carrier available. Call us M-F 7:30AM-4PM PST: 800-276-6322. 2 Straps (Choose Rack OR No Rack). Straps are 1.5" wide, 3,000 lbs strong, seatbelt-style. Will secure carrier to any car, at any highway speed (no extra straps needed). Arrival Date: Orders fulfilled by RoofBag ship the same day if placed on a business day before 2:30PM PST. Otherwise, next business day. Includes set of 3,000 lbs-strong, seatbelt-style straps that secure carrier to any car, at any highway speed. Safe and high quality materials, no toxic or harmful chemicals used. Made in USA. Size 11 fits any car, SUV or van. Size 15 fits SUVs, vans and full-size sedans. Easy to store. Easy to install- works on ALL vehicles with or without rack. 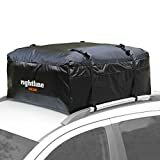 Comes with everything you need, (no extra straps needed) - Highly recommended accessory: Protective Mat protects roof and keeps bag steady (available from RoofBag Amazon store). Sporty look and high capacity system building on the ROLA heritage. Dimensions - 56" x 23" x 5.25" Assembled Platform Carton Dimensions - 48" x 28" x 11"
ATTENTION:under heavy rain wrapping the cargo bag with a plastic bag is suggested due to the small gap on the zip part. This Ohuhu Expandable Hitch Tray Cargo bag is the perfect protection piece to add to any adventurer's equipment. It has reinforced material in an extra large capacity to protect your cargo come rain or fire. It easily expands to hold more cargo and comes with 6 straps to ensure safe and secure travel and containment. 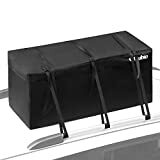 Package Dimensions: 15.7" * 11.8" * 4.7"
This special non-slip soft rubbery webbing goes between your car's roof and your RoofBag roof top cargo carrier, providing extra padding and preventing scratching of the car's finish. 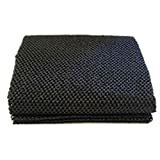 Made of woven polyester fabric coated with a special high-friction poly-vinyl compound. This Mat provides superb gripping power that protects your car's roof finish. The RoofBag Mat is tear resistant, flame retardant and treated to inhibit mold and mildew. Without the Protective Mat, wind and car vibration coupled with dirt that collects between the roof and the carrier, can scratch the roof's finish. Arrival Date: If you order on a business day (M-F) before 2:00pm PST, we?ll ship the same day and the product will get to you within 1-5 business days. Any questions at 800 2 RoofBag. Warranty & Returns Policy Unused RoofBag carriers and accessories are returnable within 30 days of purchase. Our actual shipping cost is non-refundable and a 10% re-stocking fee will be deducted from the refund unless the item did not fit your car. To avoid the re-stocking fee, customer must explain why the item did not fit the car. To qualify for a refund, returned items must arrive in new condition and must be packaged as originally packed. Shipping: Delivery is not available to PO boxes or APO addresses. Please provide physical address.